Finally it was so far. On the morning of the 25 I was present long before the starting time of the ceremonial changing of the flags at the Tribuna Antimperialista. 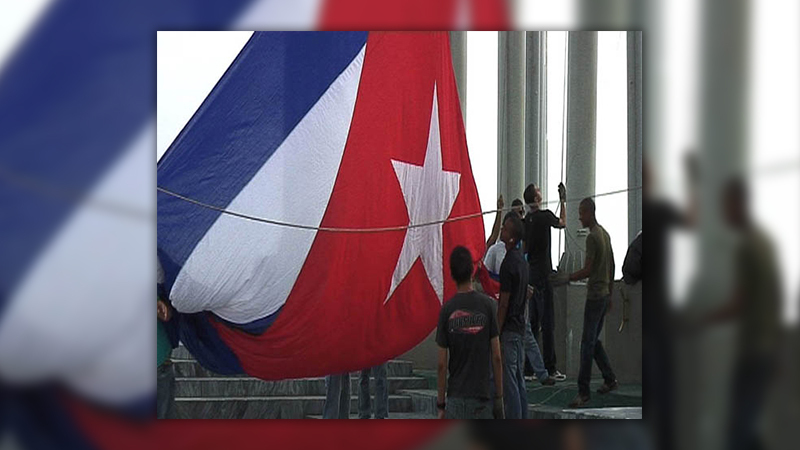 Today the black flags with the white stars will be changed with the National flag for the celebration of the 50 years of anniversary of the Republic Cuba. I like the national flag it is blue and white strips with a red point and a white star in it. The last years I have got some practice in filming difficult objects. One of the things that I have learned is to be very in time and also to act as if it is very normal that I am there with my camera. I hope in this way they get used to me and more likely that I almost belong to them. I know it sounds quiet crazy but that energy helps to get along in difficult situations. When I arrived, there was hardly anybody only the always-present soldiers in front of the American embassy. When I see that, my thoughts go to a friend from Iran. He told me that the former American minster Cheny had his office in Tehran. Where he did his business. Just in another office they declare the war to each other… But any way after 10 minutes they of course found out that there was a strange element between them. They asked me friendly to leave the situation I was showing them my permit and asked them why. I knew finally I would have to leave but as long as I could argue my camera was recoding. After that the boss spoke to me with a very soft voice that I was on a national monument and that was not a spot for me to be and he asked friendly to stay before the green line. I went and did my job on the side line. It was an impressive happening. They’re where a lot of young boys coming in and each got the responsibility for three flags. They helped each other and as I see it not one tip of the flag touched the ground. “The flag is our country”, one of the boys explained me. The black flags where handled with a little less care but still respectful Al those flags changing and so many helpers, the energy changed from this black to this colourer flags it was something. Every body seemed appy when it was done. So I was curious if there was any thing on the news in the evening. Nothing only that Raul would speak the next day at seven in the morning in Holguin. It is far from Habana in another province. In Cuba everything is very quick far. Petrol, cars and taxi’s are expensive and buses hot and mostly over crowded. Yesterday I liked to share a cake in a special 26 of July box with Oscar and his family. They are living about 15 minutes from central park in old Havana. I invited his mother in law to come to the screening of our City project Havana in Lasa. It looks quiet impossible, there is no money for a taxi. His mother in law is a strong woman from 68 years old but to go in shared taxi and buses is too much for her and time consuming. Oscar and his wife have a motor so they are more flexible. In the morning Oscar and his wife are going together on his motor to their job. First he brings his wife to the university where she teach philosophy and ethics and then he goes to the museum of belle arts where he works on the department of Flemish /Dutch arts. In the evening he picks her up again. In this way they safe a lot of money because of heir own transport. Yesterday I spent 35 CUC on taxi’s that is more then the month income from the most people here. Too much also for me but that is what happened if you want to visited places which are a little far out of the centre and you don’t want to spend hours in the sun to wait for yet another taxi which is perhaps cheaper. By accident I run yesterday in to a girl which is educated teaching English. But she is baby sitting that earns more money. The revolution from her grandparents is not her revolution she said!